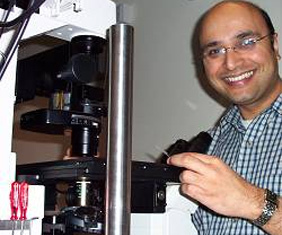 In a joint venture between the School of Physics & Astronomy and the Bute Medical School, the St Andrews researchers have advanced new technology that relies on a technique called 'Raman spectroscopy'. The research, produced by Anna Chiara De Luca, Michael Mazilu, Andrew Riches, Simon Herrington and Kishan Dholakia, is published in the the international journal 'Analytical Chemistry'. CMRCF provided the initial funding for this project, further development project has now gained continuing support from Cancer Research UK (CRUK), the Engineering and Physics Science Research Council (EPSRC) and the Chief Scientists Office. This project is the perfect example of how important the work of CMCRF can be. Such projects find it difficult to obtain initial funding, however, once a track record has been achieved significant funding can be achieved from organisations with greater funding resources.